“Right to Work” refers to the principle that every person has the right to work for a living without being compelled to belong to, pay dues to, or pay fees to a union. A Right-to-Work law does not forbid workers from enlisting in a union, and in fact protect an individual’s right-to-unionize/ But they also secure an individual’s right to disassociate themselves both organizationally and financially from a union. 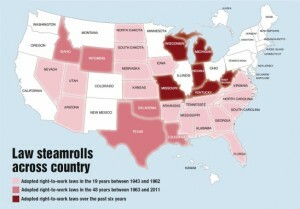 Presently, 28 states have right-to-work (RTW) laws, a number that has been increasing since the 1940’s. In just the past three years, four states, Wisconsin (2015), West Virginia (2016), Kentucky and Missouri (2017) each passed right-to-work legislation, with many more states considering RTW bills. Proponents of RTW laws see moral, economic, and constitutionalreasons for support. Morally, it is simply wrong to force anybody to join or pay money to any organization of which they do not wish to be associated. Economically, RTW states tend to be more prosperous with more jobs, more business investment, and higher real wages. Constitutionally, forced unionization violates freedom of association and, as dues are used for political purposes, freedom of speech. Opponents say that without compulsory union dues or “agency fees” workers would have an incentive to “free ride”, benefiting from union activity and negotiating power without having to contribute to it. However, it is worth noting that when given the option of not negotiating on behalf of non-union members, unions demure. Given the choice, they would rather maintain a monopoly on bargaining rights. Congress passed the National Labor Relations Act (NLRA) in 1935 with the purpose of protecting the right of workers to collectively bargain for better wages, benefits, and working conditions. The NRLA formed “closed shops”, which specify that employers may only hire employees who are already part of the union. This, of course, provided a regular, guaranteed source of income for the union. However, a decade later, it became clear that the benefits of the policy came with unintended consequences damaging to employees. The NLRA provided an index of possible inequitable policies the employer might foist on the employee, but did little to shield the employer and employees from unscrupulous unions. The Taft-Hartley Act of 1947 modified the NLRA to include a list of unreasonable labor practices on the part of unions. It banned closed shops and diluted union shops to become “agency shops,” which gives workers the option to remain employed even if they are not union members, so long as they pay an “agency fee” to the union. Workers who choose this option theoretically end up paying for a union’s collective bargaining but not for a union’s political activities. The Taft-Hartley Act also returned a portion of regulatory power of labor to the states, and gave them the option to pass right-to-work laws, which outlawed involuntary agency shops and agency fees. States that adopt right-to-work laws lead their non-right-to-work peers in three key areas: 1) Business Investment, 2) Jobs and 3) Wages. According to Stevans and Zarb (2009), right-to-work states are more likely to appeal to new businesses than states that do not have right-to-work laws. Employers value the business-labor relational predictability in right-to-work states, which frequently have better business climates. A business’s location decision is heavily dependent on a state’s status as right-to-work. According to a site adviser, who has clients like AT&T, Chevron, Dell, Honda, PepsiCo and Verizon Wireless, “manufacturing companies look for reasons to scratch off states when considering where to build major facilities—and no right-to-work law is at the top of the list. I can’t underscore how critical right-to-work status is.” A second site adviser agrees, noting that 50% of manufacturers eliminate non right-to-work states in the first round of cuts. The Federal Reserve Bank of Minneapolis found that right-to-work counties that share a border with a county in a non-right-to-work state have one-third more manufacturing jobs. Michael LaFaive’s 2013 study compares states using data from the US Census Bureau and Bureau of Economic Analysis data. From 1990-2011, right-work states exhibited a 42.6% gain in total employment compared to 18.8% in non-right-to-work states. Population increased at a 39.8% clip in right-to-work states vs. only 16.7% for non-right-to-work states. Nominal personal income grew by 209% in right-to-work states and by 149% percent in non-right-to-work states from 1990 to 2011. While it is true that the dollar-amount wages in right-to-work states tend to be lower, right-to-work states also have emphatically lower costs of living. In the second quarter of 2017, 21 of the 25 states with the lowest cost of living were right-to-work states. However, unions are only required to represent all employees, including non-union members, if the union appeals to the federal law allowing them the option of “exclusive bargaining representation.” Should a union invoke this privilege, the union negotiates for all company employees, and is not obligated to ask employees if they agree with this method of negotiation. If the union does decide to use exclusive bargaining, the union cannot discriminate against those outside the union by offering them lower pay. The National Labor Relations Act does not coerce unions to represent those outside the union. Federal law gives unions the ability to bargain exclusively for dues-paying members. William Gould, former chairman of the National Labor Relations Board calls this process ‘members-only’ bargaining for employees. The Supreme Court has, on two occasions, recognized the right unions have to solely represent paying members if they choose to, first in Consolidated Edison Co. v. NLRB (1938) and then in Retail Clerks v. Lion Dry Goods Inc. (1962). In theory, if a union forgoes the option of exclusive bargaining, the union would necessarily represent only those employees who had voluntarily agreed to pay dues in a signed contract. In practice, this rarely occurs. Unions are extremely protective of their monopoly right to bargain on behalf of all employees with the employer. So unions eagerly claim their privilege to bargain wages for all employees, and then use their decision as the explanation for why employees should be forced to pay union dues in non-right-to-work states. There is nothing inherently “crippling” about unions being pushed to demonstrate their worth to workers by constructing a completely voluntary relationship between the worker and representative. Knowing that the workers could terminate the relationship at will forces union leaders to respond promptly to those they represent. Right-to-work laws do not necessitate a decrease in union membership. Case in point: the right-to-work state of Nevada contains the Culinary Union Local 226. Nevada has been a right to work state since 1952, and Culinary Local 226 has still managed to increase its membership from 18,000 in 1987 to 57,000 in 2017. While Yeselson bemoans the “free ride” non-union workers get from unions in right-to-work states, he also credits Culinary Local’s “intense advocacy” for its accomplishments in getting nearly 100% of eligible hospitality workers to join the union. Culinary Union leaders have made, by Yeselson’s reckoning, Culinary Local 226 the “most powerful local union in the country.” The leaders are not separated from union members by a coldly impersonal process like the automatic collection of dues. They must regularly request that union members “buy in” to the union, and they have succeeded with flying colors. It is doubtful that Culinary Local 226’s would have been so enthusiastic if it were not beholden to member involvement because of Nevada’s right-to-work law. Oklahoma became a right-to-work state in 2001. Eleven years later, the President of the AFL-CIO Jimmy Curry remarked, “Somebody asked me how many workers got out because of right-to-work and I said, well, we don’t track that number…It’s like any other workforce, where 10% cause you 90% of your problems. Those are the ones that bailed out of paying dues.” Curry’s indifference toward right-to-work suggests that unions don’t have anything to worry about so long as they maintain good relations with workers. After Oklahoma became right-to-work, Curry ascertained that “our labor-management relationship was terrible.” Since RTW was passed, that relationship improved. The truth is, unions are losing members across the US at a rapid rate, regardless of whether or not a RTW law is in place. 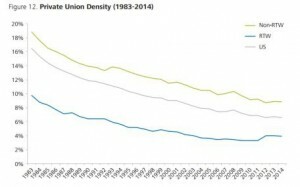 In fact, non-RTW states are losing members at a faster rate, a decrease of 9% from 1983 to 2014, versus a decrease of only 5% for RTW states. Since Taft-Hartley was passed 70 years ago, more and more states are finding that it is in their interest to adopt right-to-work laws. Right-to-work laws assist states in attracting businesses, generating jobs, and giving workers the ability to earn higher wages. Above all, right-to-work laws empowers individuals to decide for themselves if union representation is right for them. Vermont should set an example to the rest of New England and become the first state in the region to become right-to-work. “Right to Work Increases Jobs and Choices,” James Sherk, The Heritage Foundation, November 9, 2011, at www.heritage.org/research/reports/2011/11/right-to-workincreases-jobs-and-choices. “The Effect of Endogenous Right-to-Work Laws on Business and Economic Conditions in the United States: A Multivariate Approach,” Lonnie K. Stevans, Frank G. Zarb http://papers.ssrn.com/sol3/papers.cfm?abstract_id=1027987. “Tesla update on earnings, gigafactory expected Thurs,” Albuquerque Journal, July 29, 2014, at www.abqjournal.com/437398/biz/tesla-update-on-earnings-gigafactoryexpected-thurs.html. “A year later, right-to-work effects tough to measure,” The Toledo Blade, December 15, 2013, at www.toledoblade.com/Economy/2013/12/15/A-year-later-right-to-work-effectstough-to-measure.html. “The Effect of State Policies on the Location of Manufacturing: Evidence from State Borders,” Thomas Holmes, Federal Reserve Bank of Minneapolis and University of Minnesota, Journal of Political Economy, September 1996, at www.minneapolisfed.org/research/sr/sr205.pdf. “How Right-To-Work Laws Affect Wages,” W. Robert Reed, Journal of Labor Research, October 2003, at http://link.springer.com/article/10.1007%2Fs12122-003-1022-1#page-1. University, and Michael LaFaive, Mackinac Center for Public Policy, 2013, at www. November 9, 2011, at www.heritage.org/research/reports/2011/11/right-to-workincreases-jobs-and-choices.